Did you know that the average household generates 7-10 pounds of food waste per week? 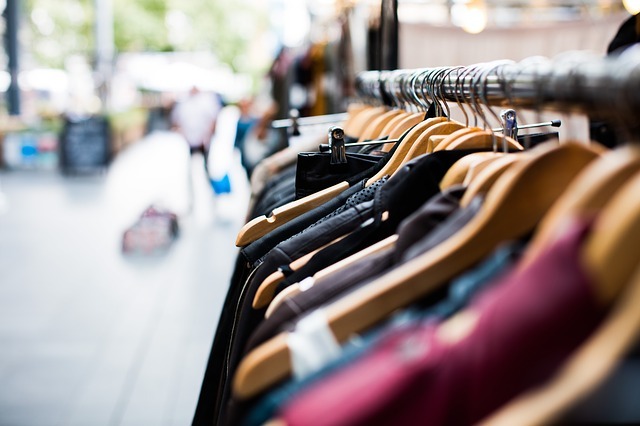 Did you know 53% of this waste is avoidable? Vegetables and fruits account for 50-60% of total food waste, followed by cereal and grains (13% of total food waste), meat and fish (8%), dairy and eggs (5%). This data was presented at a 2015 conference by Dr Mike von Massow, Co-Director of the University of Guelph Food Waste Project. Food waste is a problem for many reasons. It is estimated that $14.6 billion dollars worth of food is wasted each year! But food waste is not just a financial issue. According to the United Nations Environment Programme, it is also a problem for our environment. Food waste is an inefficient use of energy, water, labour, capital, fertilizers, pesticides, and fuel used for transportation. And, it needlessly creates greenhouse gas emissions. Food waste happens in many places in our society – restaurants, grocery stores, prisons, processing facilities and individual households. Have you ever bought food with the intention of using it but ended up throwing it away? I have. This simple act of throwing away food contributes on a mass scale to food waste. When I throw away food, it is usually vegetables or fruits. Sometimes there is a mismatch between the amount of vegetables and fruits I buy and the appetites in our house. Other times, this mismatch is a result of my poor forecasting of our family’s ability to eat the food before we go out of town or go out to eat. But there are more reasons why food waste happens. Criteria! How do you decide what food to throw away? Its appearance? Its taste and smell? The best before date? The number of days in the fridge? It turns out that the more criteria you have for deciding what food to discard, the more food that tends to be thrown out. With the recent city-wide roll-out of green carts in Calgary, there is a ground swell happening around building awareness of food waste. It inspired me to think about ways to minimize my food waste. Here are 13 strategies I have used to minimize my food waste. Do a plate-waste audit – look at what and how much food you throw out or composte. Do a lunch box audit – what food is coming back home? My one son’s lunch kit routinely comes home with oranges. When I investigated what the problem was, it was that he didn’t know how to peel it. We added an orange peeler to the lunch kit and now, he will eat the orange! What kinds of food do you throw out? When do you throw it out? Why is it being thrown out? Is the food really past its prime? Or do you need ideas of how to use the food in its current state? Become curious about food waste in your house and how you contribute to it. Take an inventory of the foods you have in your home each week. What food do you need to use up? What food do you need to replace? Make a grocery list and buy your regular staple foods . Don’t buy food you don’t know how to use unless you have a specific purpose in mind. 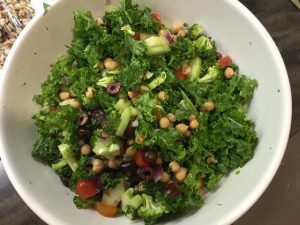 As a Calgary dietitian and nutritionist, I have had many clients describe how they buy lots of fresh foods because they know they should eat more of these foods and want to feel healthier – but then, because they don’t have a plan for how to use an unfamiliar food, they end up throwing the food away. What a waste of money, a waste of food, and a way to lose lifestyle confidence. Be aware of how much food you buy when you shop at big box stores. With the big bulk foods available, there is the potential for more food waste if there are not enough people to help you eat up that food. 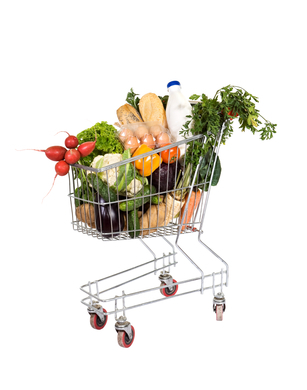 Balance buying perishable foods (milk, bread, vegetables, fruits, meats) purchases with frozen, canned and dried food purchases. We regularly buy frozen fruits and vegetables so we can have these foods available, even at the end of the week when our fresh produce has been eaten up. In fact, buying frozen vegetables is a great time-saving strategy – the vegetables are all-prepared for you. You simply need to cook them! Cut up and pre-prepare your vegetables. Wash and dry your lettuce. Cut up your peppers and carrots for the week ahead. Doing this work ahead will help you use up the food you have. Put extra loaves of bread in the freezer. Put meat/fish and poultry that you won’t use over the next 48 hours in the freezer. One of the best changes you can make to your diet is to include more vegetables in your diet. One of the easiest ways to do this is to keep your vegetables visible! 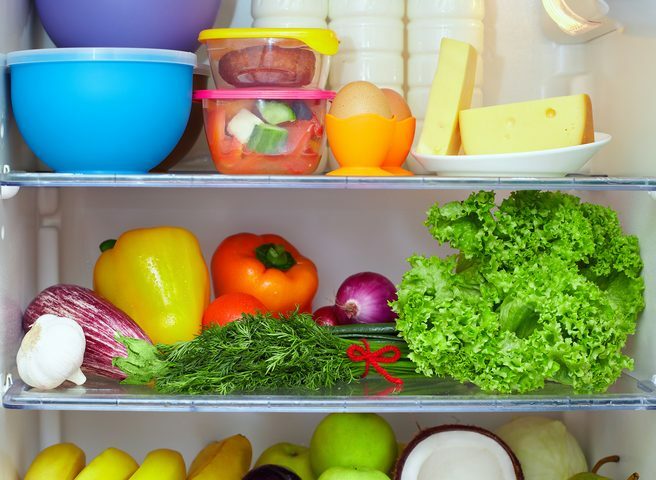 In my post on 5-Steps for setting up your kitchen for dietary change, I talked about giving prime fridge real-estate to foods you want to eat more of. 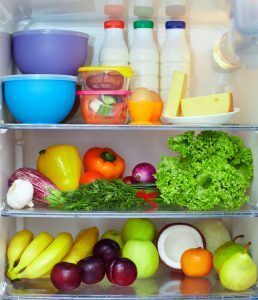 Instead of stuffing all your fresh foods in your fridge’s crisper, make your fresh foods visible so you are cued to eat these foods! Become mindful of how much food you routinely portion out for your family. Things like large cups, bowls and plates serve as environmental cues of how much food you will likely portion out. We have a set of pink bowls that my kids use for their cereal. The pink bowls are about 2.5 cups and my kids routinely pour in cereal and milk to fill this bowl. They gobble up the cereal and drink some of the milk. Recently, I recycled these pink bowls for smaller, more portion-reasonable bowls. Already, we are throwing away less milk by simply becoming more portion aware! In our house, we become very aware of what and how much food we are purchasing when we are within 2 weeks of going out of town. Don’t buy what you won’t use. Dr von Massow’s research found that the more connected you are to food, the less likely you are to throw out food. You can connect with your food in several ways. Go to a farmer’s market to get connected to where your food comes from and the farmers who grow your food. Grow your own food. It is much more painful to throw away vegetables that you actually cared for than an anonymous head of cabbage. You can also connect with food by actually cooking. 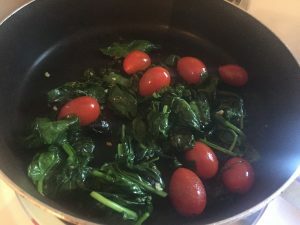 Not only does cooking help you use up the food you have on hand, I have found that cooking enhances respect for food ingredients on a more spiritual level. When trying a new recipe and you like it, plan to make that recipe again over the next week or so, so that that food it becomes more intuitive to make on a busy day. Expand how you consume foods. For example, if you bought spinach with the intention of enjoying a spinach salad, but now the spinach is wilted, sauté the spinach in some oil and sea salt, and enjoy a simple side dish with your meal. Cooking does not have to be fancy or complicated. Despite what you may see on social media feeds, meals can be simple and satisfying, even if they look dull and routine. 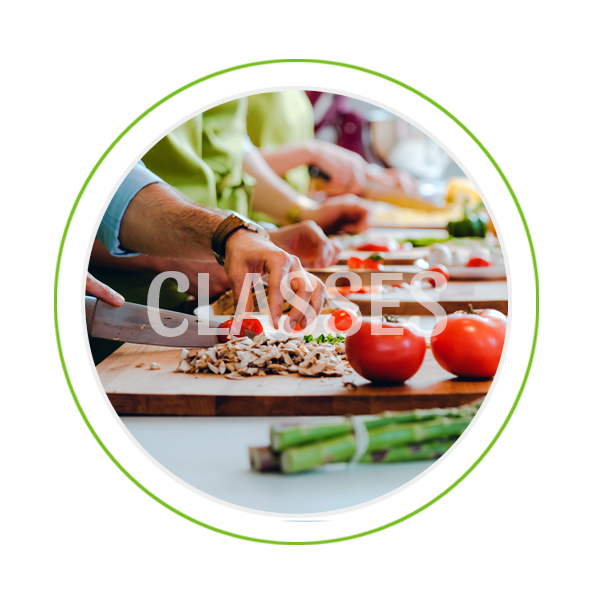 If you need help with enhancing your confidence in the kitchen, take a private or group cooking class. Learn how to repurpose your meals into tomorrow’s lunch or supper. 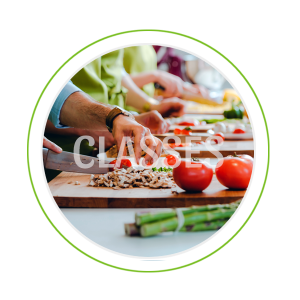 Get inspiration by taking a cooking class. Before you throw out food, ask whether there is another way you can use food? Ex: left over roast beef can become sandwich meat or the basis for a shepherd’s pie. Unused cabbage can become a delicious addition to a simple stir fry. Overly brown bananas make the start of a banana bread. Left over stir fry becomes the filling for my kid’s wraps the next day. Grocery shopping less often can help force you to get creative with using up the foods you have on hand. This change, in our house, has resulted in throwing out less food, and has also cut our grocery costs each month. When you eat out, you are not eating the foods you have at home, increasing the likelihood for food waste. Understand best before date Food past best before dates is not necessarily unsafe. Learn about food safety and proper food storage. There are great websites for this information. I’d love to hear your ideas for how you reduce the amount of food you waste. 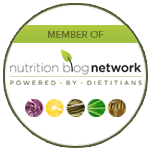 If you need help with meal planning, organizing your meals, and reducing your food waste, connect with me to see how my nutrition coaching packages can help you save money and throw away less food.